First of all congratulations for coming shifting to iPhone from android and it’s not easy for an android user to get used of iPhone from the start especially when you’ve used an Android device from every long time. I still remember the first time I bought my android phone and a few years ago I shifted from android to ios user by buying new iPhone and the experience was great. One of the basic problems every user who just started using iPhone is how to get their important files like music, videos which they have saved on their Android device to iPhone. If you’re a music lover who is looking for a solution on how to transfer music from android to iPhone then here you will find it. As a music lover I have saved tons of my favorite songs in my android phone and when the time came to shift all of these songs from android to iPhone I found it difficult because there was no definite guide on it. However, after doing some googling I found some nice ways through which you can get a solution for how to transfer music from android to iPhone and here I’ve added those different solutions so go ahead select any of them according to your preferences. One of the quickest and easiest ways to transfer music from your Android phone to newly bought iPhone is by using a PC. Many people who use newly iPhone don’t get that much familiar with its usability and it’s hard for them to sue various applications. So instead of going into that much technical things, I will recommend this method for those people who have got PC with them and which you can use to transfer music from android to iPhone. So just follow these steps to do that successfully. First of all, Connect your Android device to your computer and find your music. On most devices, you can find these files in Music. On a Mac, install Android File Transfer, open it, then go to Music. Just disconnect your Android device and try to connect your iPhone to your computer. Then open iTunes on your computer, go to the Library, and click on Music. Now open the folder where you put your songs and drag it to the Music view in iTunes. Now select your ios device and sync it with the music. Now you can add as many as songs you want according to your preferences. One of the most asked questions which are asked by new iPhone users is that can they transfer music from their Android to iPhone without using the computer. Yes, you can get your music, photos and other data transfer in your iPhone from the Android device without using PC but you will have to use some third party apps to transfer the music and such apps are like share it, sender and in the following paragraph I’ve explained how one can use them. If you want to transfer your data from one device to other devices and that too in great speed then one of the best methods to do that is installed and use xender. I have been using this app in both of my android and iPhone to transfer music, videos, and bulk files and still I love it because this app lets you use your wifi network to connect other device and due to that you will be able to transfer any type of data from your device to other. If you want don’t know how to transfer music from your android to iPhone using share it then doesn’t worry the following guide will help you to do that so just follow these steps and get your music transfer done in less than minutes. Then try to connect the devices to the same WiFi network and open the shareit app on iPhone and Android device. Then go to the android device from which you want to send the music files and select the music folder which you want to send and then tap SEND. Now on the receiving device i.e. iPhone tap on the RECEIVE button. The iPhone should now be displayed on the sender’s screen and then select your iPhones avatar image which you want to pair from your android phone. 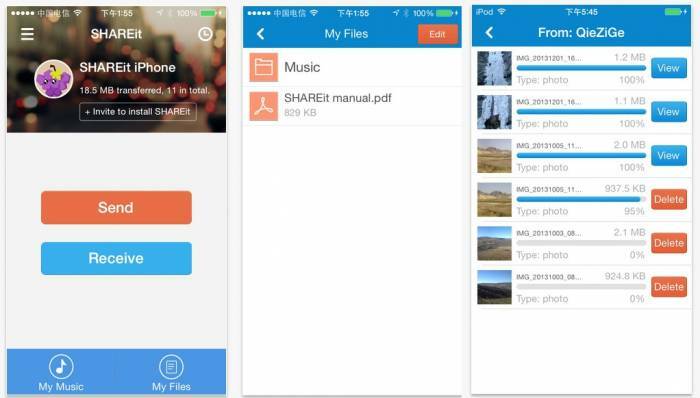 Note- you can use another app like Xender too to transfer the music files from Android to iPhone without using any PC and you will have to follow the same procedure as above to successfully transfer the files. So you can either use PC to transfer your music to your newly bought iPhone from android and if you don’t have any PC then you can follow the second method. We hope you liked this article and if you have got any doubts then leave that in the comment section and we will try our best to resolve them.